Last week we launched the Nine Dots Prize, an exciting new prize for creative thinking that tackles contemporary societal issues. Entrants are asked to submit a 3,000-word response to a question set by the Prize’s 12-strong Board of internationally recognised and distinguished academics, authors, journalists and thinkers. The Prize is worth $100,000, which will support the winner to write a short book expanding on their ideas to be published by Cambridge University Press. As well as overseeing the development of the branding and website, launching the Twitter account, harnessing the support of stakeholders and handling the media relations, we arranged a photo shoot to give us some bold, eye-catching and engaging images to use across owned, earned and shared channels. Our creative concept emerged from the Prize’s aim of promoting innovative thinking to address problems facing the contemporary world. 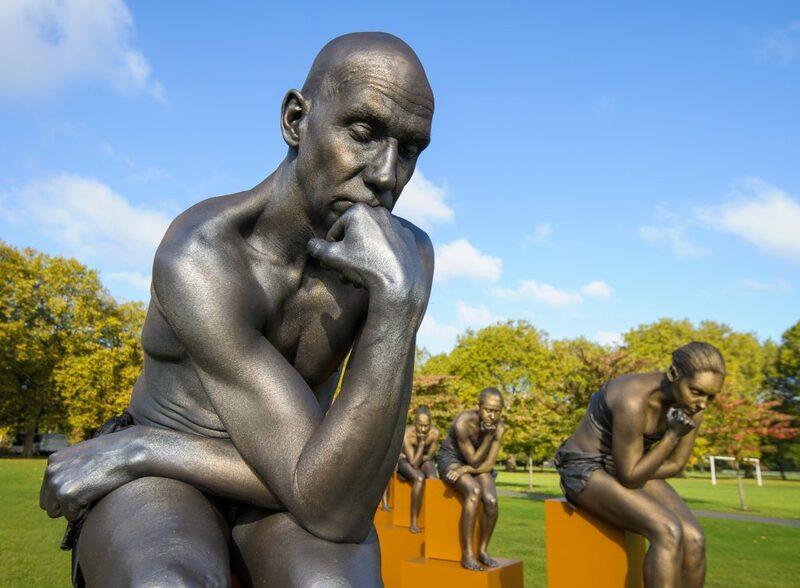 There’s not a more iconic visual symbol of deep thought than Rodin’s famous The Thinker, so we decided to gather nine ‘Thinkers’ in a central London location for some beautiful images that reflected the identity and the objectives of the Prize. We worked closely with our chosen photographer and event management company to make our vision a reality, carefully planning every detail from the exact location in Battersea Park to the colour body paint to be used on the models. The photo shoot resulted in a fantastic selection of images, ranging from artistic and intellectual to cheeky and fun – you can view the whole set on our Facebook page. As well as sending out the images to titles like the Guardian and The Bookseller, we liaised with supporters of the Prize Cambridge University Press and the Centre for Research in the Arts, Social Sciences and Humanities (CRASSH) to make sure the photos were used online as widely as possible on launch day and the period immediately following. The images certainly helped us make a splash, and within five days of the launch we had attracted over 200 Twitter followers and just under 200 subscribers to the Nine Dots Prize newsletter. News of the launch reached as far as France, Germany, Italy and Sweden and made the front page of Reddit – peaking at number 15. …and see our press release for more information on the Nine Dots Prize. Latest news and personal views from Team Riot.